The Australian City Farms & Community Gardens Network has been working with local government and new community garden groups to formulate community garden management plans. What follows is a set of common topics that community gardeners have found useful in devising a management plan. This is followed by link to examples of community garden management plans. The plans are proactive and need not be complicated. Their advantage lies in setting up decision making, conflict resolution, communication and planning processes before garden development starts. Time spend in developing management plans is seldom wasted. Devising a management plan should be the second activity undertaken by a new community garden groups, following the formation of the core group and before applying for access to land (which includes submission of the management plan and draft design). Once access is given and legal details are finalised, then you can start the design and construction of the community garden. Formation of core group > development of management plan > gain access to land (submit management plan and draft design with application ) > approval and legal details > detailsed design process > construction > ongoing maintenance and management. demonstrates to local government or other landholder that your group has the organisational capacity and persistence to manage an area of land. 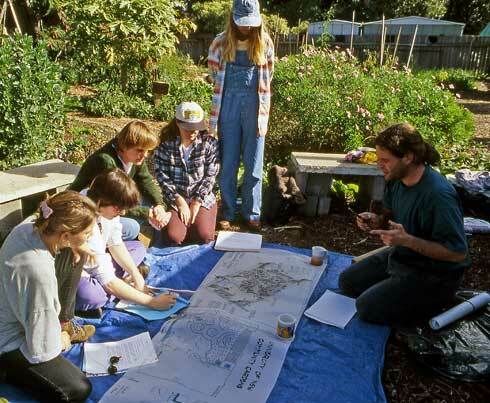 This Management Plan template is about the governance of your community garden…. it’s about social design rather than site design although it does cover management of the site in general. The Plan was developed through participatory processes with the cooperation of teams setting up new community gardens. As a participatory design process developed over a number of years, approaches adopted in its development included World Cafe, the Workshop Method , structured conversation and strategic questioning. The need for establishing governance processes for new community gardens has been evident for some time. It has become apparent over the years that the lack of clear means of dealing with conflict and with dominating personalities in community gardens can drive away gardeners and even lead to the abandonment of gardens. The need for establishing some kind of agreement among gardeners about conduct, decision making processes and resolving disagreement is a learning of community gardening. Another reason for developing the Plan was that some local governments ask for a plan of management as part of their application for assistance in community gardening process. The Plan will be reviewed from time to time and changes made. We welcome your feedback on using the plan so that timely changes can be made. 1.2 Objectives of our community garden? 2.2 Will our garden use organic gardening practices? The topics that follow are a guide. You may have additional topics to consider or, perhaps, you may not need all of these. objectives — things we would like to accomplish. how will you resolve disagreement? how you will communicate between the management team and membership and with the landholder/public/media? how will you manage safety and health in the garden ? (eg safe use of tools)? outline the training process for new garden members related to safety in the garden. To ensure that new members understand their rights and obligations, and to ensure that behaviour in the community garden is acceptable to the group, some community garden teams have devised a gardeners’ agreement that new members accept as a condition of membership. what will be your process of inducting new gardeners? what initial training will be needed in the start-up stage of the garden? how the garden will involve the local community? Thanks for this head start. We are a long running garden that pre-dates any requirement for a management plan. Recent changes (for the better!) mean we need to put a plan in place. I had no idea where to start. Thanks again. Have you found out how to download??? Im having trouble too! We have uploaded a pdf version for you to print out. Will check the word document to see why it is not printing. Thanks for letting us know you are having trouble so we can find out what is happening. Hi there, thanks for this great information- is there a broken link here for downloading the management plan template? Thanks for picking this up – we updated the website and some of the pages still have some of the old button code in them. It should all work fine now.